Modern take on culottes combining the practicality of shorts with the appearance of a skirt. 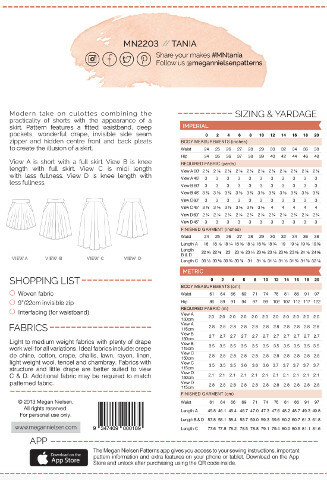 Pattern features a fitted waistband wonderful drape invisible side seam zipper and hidden centre front and back pleats to create the illusion of a skirt.Version 1 is mini length Version 2 is knee length and Version 3 is midi length .Skill: 2/5Sizing: XS-XL (each pattern includes all sizes)This pattern works well with light to medium weight cottons (voile bastiste or lawn) and lightweight linen. Additional fabric may be required to match patterned fabric.